We support desktop first approach, i.e. we take as input a template developed for the desktop. Then graceful degradation is performed for smaller screens. Content width should be one of the following: 720, 750, 940, 970, 1140, 1170 pixels (correspondingly, container width will be 750, 780, 970, 1000, 1170, 1200 pixels). As content we treat all the layers except those which have width of the template (i.e. except full length backgrounds). Template itself may have any width. Layers should be positioned according with the grid. The more precise positioning is the better. It is highly desired for the layers to be grouped logically into rows and columns. We continue improving PSD to Bootstrap conversion. If you have any ideas, proposals or comments regarding the way how Bootstrap template is generated – please, share them with us. That will help us to implement the most requested functionality quicker. 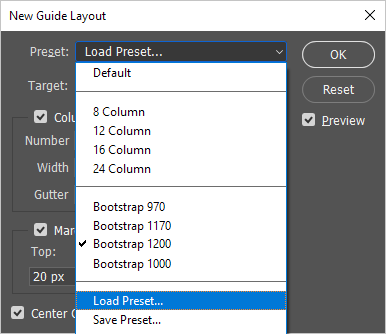 Once Guide Layout is enabled, Photoshop will help you with precise positioning of layers according to the Bootstrap grid.